The global market for metal oxide varistor (MOV) has been deriving much growth from the rising popularity of Internet of Things (IoT) across the world. The extensive increase in the demand for consumer electronic goods and the upsurge in the adoption of metal oxide varistor in automobile applications are also boosting the market’s progress remarkably. Over the forthcoming years, the global market for MOV is likely to witness substantial growth at a healthy CAGR of 11.7% from 2017 to 2025. The opportunity in this market is expected to increase from a value of US$7.73 bn in 2016 to US$20.79 bn by the end of 2025. The market, although looks thriving at present, it may face challenges from the dynamic nature of the semiconductor and electronics industry in the coming years. Based on the type of MOV, the global MOV market has been classified into disc MOV, strap MOV, block MOV, ring MOV, and various other types, such as chip varistor and multilayered chip varistor. The ring MOV segment held the leading position in the global market in 2016 with a share of more than 44%. Analysts expect the segment to remain dominant over the next few years. Disc MOV, however, is anticipated to witness a high-paced rise in the near future on the ground of its increasing demand in industrial power electronics devices across a number of countries, such as China, India, Japan, the U.K., the U.S., Germany, and Singapore. On the basis of construction, the global market has been segmented into surface mount MOV and through-hole MOV. Although marginally, the through-hole MOV segment has been leading the overall market and is intended to remain doing so throughout the next few years. In terms of the geography, Asia Pacific, the Middle East and Africa, Europe, North America, and Latin America have been considered as the prominent segments of the worldwide MOV market. Driven by the increasing demand for smart devices, Asia Pacific led this market in 2016 with a share of more than 54%. Analysts expect this regional market to gain substantially from the swift development in the industrial infrastructure that supports integration of process automation, and the large scale investments in communication technologies in this region, and remain on the top over the forthcoming years. The market for MOV in the Middle East and Africa, which stood second in 2016, is also projected to retain its place in the near future, thanks to the increasing demand for consumer electronics, smart automobile applications, technologically advanced healthcare devices, and process automation systems in the power, and the oil and gas industries. Among others, the Europe MOV market is anticipated to witness healthy growth in the years to come on account of the rising number of smart phone users. Germany and the U.K. are likely to surface as the leading domestic markets for MOV in Europe over the forthcoming years. TDK Corp., General Electric, KEMET Corp., Moda-Innochips Co. Ltd., MDE Semiconductor Inc., Dean Technology Inc., Centra Science Corp., Amotech Corp., Vishay Intertechnology Inc., and Murata Manufacturing Co. Ltd. are some of the prominent players operating in the global MOV market. The report covers the analysis and forecast of the metal oxide varistor (MOV) market on a global and regional level. The study provides historic data of 2016 along with the forecast for the period between 2017 and 2025 based on revenue (US$ Bn). The report provides the size of the metal oxide varistor market in 2016 and the forecast for the next nine years up to 2025. 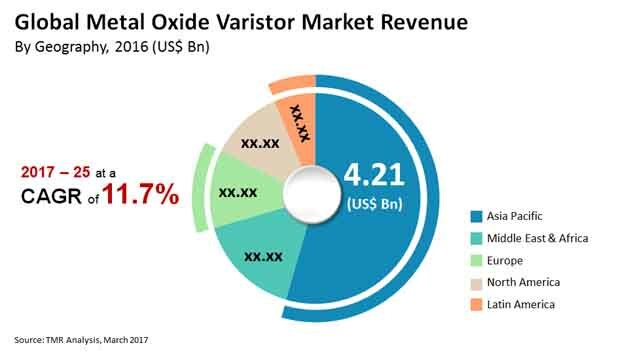 The size of the global metal oxide varistor market is provided in terms of revenue. Market revenue is defined in US$ Bn. The market size and forecast for each type and end user segment are provided in the context of global and regional markets. Numbers provided in this report are derived based on demand generated from different end users and types. Market dynamics prevalent in North America, Europe and Asia-Pacific have been taken into account for estimating the growth of the global market. The study provides an in depth analysis view of the metal oxide varistor market by segmenting it based on type, end user industry, construction and composition. On the basis of type, the metal oxide varistor market has been further segmented into disc metal oxide varistor, strap metal oxide varistor, block metal oxide varistor and ring metal oxide varistor among others. Others metal oxide varistor segment includes chip varistor, multilayered chip varistor and many others. On the basis of end user industry, the metal oxide varistor market is segmented into automotive electronics, line voltage equipment, wireless handset telecommunication, industrial power electronics, consumer electronics, lighting ballasts and others. Others end user segment includes defense, aerospace and healthcare among others. Geographical segmentation signifies the current and forecast demand for North America, Europe, Asia-Pacific, Middle East & Africa (MEA) and Latin America. These have been further sub-segmented into countries and regions in relevance to the market. The segmentation also includes demand for individual type, construction and end user in all regions. Market estimates for this study have been based revenue being derived through regional demand trends. Demand for metal oxide varistor has been derived by analyzing the global and regional demand for metal oxide varistor in each application for its respective functions. The global metal oxide varistor market has been analyzed based on expected demand. Forecasts have been based on the expected revenue of metal oxide varistor’s type, application in different end user sector. We have used the bottom-up approach to estimate the global revenue of metal oxide varistor market split into regions. Revenue has been determined with the help of revenue of each type and application in each region that again is derived from the percentage share of each segment. Later, we have summed up the individual revenues from all the regions to achieve the global revenue for metal oxide varistor. The end user split of the market has been derived using a bottom-up approach for each regional market separately, with the global end user segment split being an integration of regional estimates. Companies were considered for the market share analysis based on their product portfolio, revenue, and manufacturing capacity. In the absence of specific data related to the sales of metal oxide varistor of several privately held companies, calculated assumptions have been made in view of the company’s product portfolio and regional presence along with the demand for products in its portfolio. The competitive profiling of the key players in the global metal oxide varistor market across five broad geographic regions is included in the study. These include different business strategies adopted by the leading players and their recent developments as in the field of metal oxide varistor. A descriptive analysis of the market dynamics that is inclusive of market drivers, restraints and opportunities is included in the purview of the report. Additionally, the report includes potential opportunities in the metal oxide varistor market on the global and regional level. Market dynamics are the factors which impact the market growth, thereby helping to understand the ongoing trends of the global market. Therefore, the report provides the forecast of the global market for the period from 2017–2025, along with offering an inclusive study of the metal oxide varistor market. The report covers a detailed competitive outlook that includes market share and company profiles of key players operating in the global market. Key players profiled in the report are TDK Corporation, General Electric, KEMET Corporation, Dean Technology Inc., Moda-Innochips Co. Ltd., MDE Semiconductor Inc., Centra Science Corp., Amotech Corp., Vishay Intertechnology Inc. and Murata Manufacturing Co. Ltd. among others.